Imagine walking out your back door to reach the ski slopes at Snowmass Resort. The Chamonix Condos deliver this experience. This 3 bedroom, 3 bathroom Gold-Rated condo has almost 1,300 square feet of space to accommodate up to six guests. Enjoy the European decor as families sit by the fireplace and enjoy each other's company high in the Rocky Mountains. For events or gatherings, the unit has its own balcony with BBQ, a wood-burning fireplace and plenty of space. Three bedrooms with en-suite bathrooms will accommodate groups of friends or family traveling together. Light colored wood, neutral colors, and handy sitting areas make the bedrooms a great place to relax. There's no reason to leave the building if you enjoy working out or taking a dip. The fitness center, heated swimming pool, hot tub, slope side ski locker room and complimentary underground parking are all on site. Amenities at Chamonix include gourmet kitchens, washer and dryers, fireplaces, whirlpool baths or steam showers, and free WIFI. Keep in mind that each condo is designed according to its owner. Gondola Resorts delivers first-class services to our guests, including free Aspen Airport and on-demand shuttle service around the resort and to downtown Aspen. Ask about weddings or conference services as we help our guests plan for any event at Snowmass Resort. 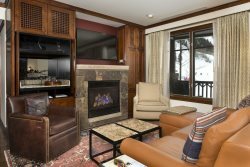 Your vacation at Chamonix 41 includes free limo transfers to Snowmass Village. In the evening, make the 15-minute shuttle ride to downtown Aspen for restaurants, live music, shopping or just walking around this histrcal chic town. For a memorable day trip treat yourself to a few hours at Glenwood Hot Springs which is only 45 minutes north of Aspen. Gondola Resorts of Snowmass Colorado offers the finest vacation rental properties in some of the most spectacular ski-in ski-out locations. With most of our condominium and residence club condos either ski/in ski/out or within walking distance to Snowmass Village, it’s easy to choose the perfect luxury home-away-from-home every time at Snowmass.